Equinus is a condition in which the upward bending motion of the ankle is limited. Someone with equinus lacks the flexibility to bring the top of the foot toward the front of the leg. Equinus can occur in one or both feet. When it involves both feet, the limitation of motion is sometimes worse in one foot than in the other. People with equinus develop ways to "compensate" for their limited ankle motion—and this often leads to other foot, leg, or back problems. The most common methods of compensation are flattening of the arch or picking up the heel early when walking, placing increased pressure on the ball of the foot. Other patients compensate by "toe walking," while a smaller number take steps by bending abnormally at the hip or knee. There are several possible causes for the limited range of ankle motion. 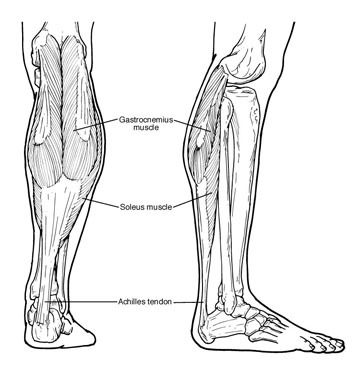 Often it is due to tightness in the Achilles tendon or calf muscles (the soleus muscle and/or gastrocnemius muscle). In some patients, this tightness is congenital (present at birth) and is sometimes an inherited trait. Other patients acquire the tightness through situations that keep the foot pointing downward for extended periods—such as being in a cast, being on crutches, or frequently wearing high-heeled shoes. In addition, diabetes can affect the fibers of the Achilles tendon and cause tightness. Less often, equinus is caused by spasms in the calf muscle. These spasms may be signs of an underlying neurologic disorder, such as cerebral palsy. In some cases, surgery may be needed to correct the cause ofequinus if it is related to a tight tendon or a bone blocking theankle motion. The foot and ankle surgeon will determine the type of procedure that is best suited to the individual patient.